As an Obstetrician/Gynecology resident physician, I utilize obstetric ultrasounds on an almost daily basis, both in my training in academic hospital, as well as limited-resource settings. I reviewed The Fetal Weight App from the mindset of a obstetric care provider who may not have access to formal ultrasound imaging, formal ultrasound reports, and/or an organized filing system to track ultrasound data for patients. I am currently in East Africa. Most of my patients cannot pay for ultrasounds and the ultrasound reports we do have are limited by lack of an electronic system and an often chaotic chart. My interest in this application is that of tracking both formal and bedside ultrasound data for my patients. This app was utilized on an iPad. 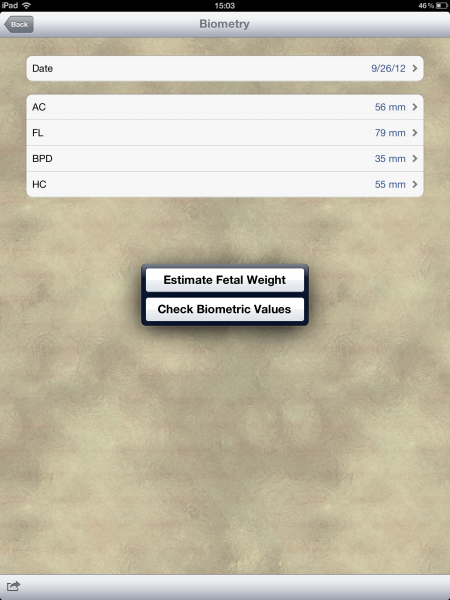 The Fetal Weight App, developed by Sandro Tolaini, was first available in the App Store in 2010. It is now in version 2.1, with the most recent update in 2011. The app is available for both the iPhone and the iPad and functions to calculate and track fetal weight from standard fetal biometric measurements. The opening screen opens a blank page the first time you use the application. Once you have added a patient, the patient’s name and info is accessible from the opening screen. In order to add a patient, you click the + radio button in the bottom left corner. 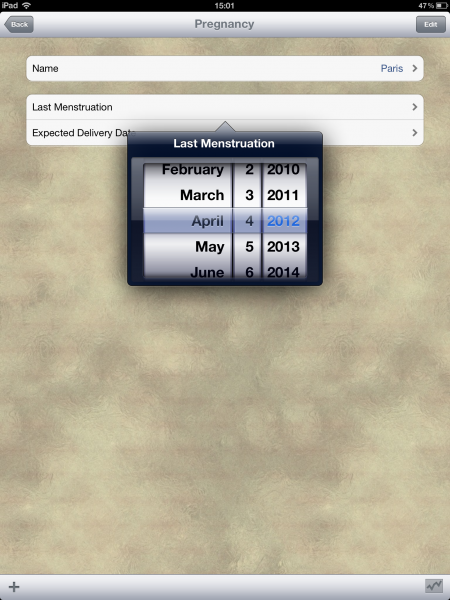 From here you are taken to a screen to add the patient’s name and last menstruation (last menstrual period, LMP) or expected delivery date (EDD or EDC). Putting in the LMP will calculate the EDD and vice versa. While neither the LMP nor the EDD must be entered at this point, the option to “Check Biometric Values” will not function until it has been entered. Unfortunately, there is no option for calculating the EDD based on standard fetal biometric measurements. Once a pregnancy is added, you need to hit the back button to get to the home/opening screen. Once back at the home screen, you can add fetal biometry for the patient by selecting the patients name. The default date is the current date, but can easily be changed. From the ultrasound data, you then enter in millimeters the measurements of abdominal circumference, femur length, biparietal diameter, and head circumference. Once these are entered, you can go back to see the patient’s other fetal biometry records or edit/browse those of other patients. Selecting a patient brings you to that patient’s home screen. This screen is the point of reference for the apps two main features. 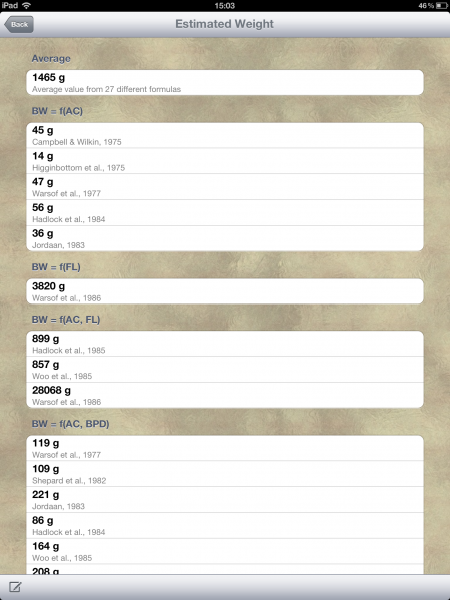 Selecting the “Estimate Fetal Weight” option brings you to the Estimated Weight section. There are many methods for calculating fetal weight – this app includes 27 of them and gives you an overall average of the fetal weight. You can scroll in a vertical direction to see various calculations, organized by which of the fetal biometric measurements is/are used in the formula, the author of the calculation, and the year of publication of the formula. 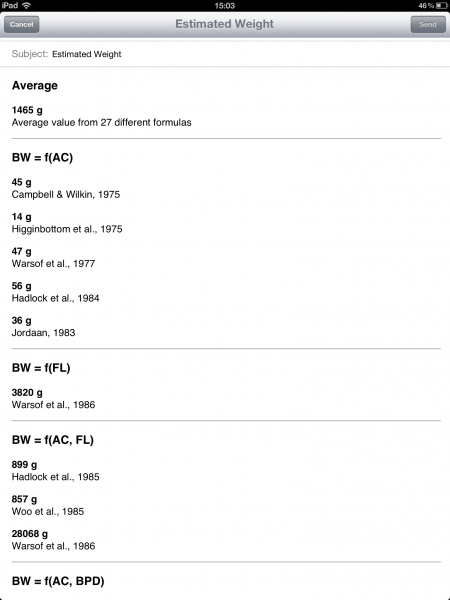 At the top of the page, an average of the 27 formulas is given. At this point, you can choose to go back to check biometric values, go back to another patient, or by clicking on the pencil/box icon in the lower left corner, you can email that page of estimates. The “Check Biometric Values” section allows you to compare biometric values at your patient’s gestational age to norms. This option is only available if the estimated gestational age (EGA) is inputted in the system via the user entering the EDD or LMP. If you have not already done so, you have to go back to the patient’s information and add this. The application does not include formulas for estimated gestational age based on formulas, limiting the overall utility of the application. Once you have the EDD/LMP and the biometric values, the “Check Biometric Values” portion of the application will function. The Biometric Values section includes several useful pieces of information. The dates for LMP, fertilization, start of the 2nd trimester, start of 3rd trimester, and EDD are listed. These are followed by the gestational age and the fetal age (clinically and in discussion with patients, the gestational age is used.